Salads don’t have to be ho hum affairs made only with lettuce, bottled dressing, and a few token pieces of bland tomato. Salad can be the star of a meal and feature robust grains and starchy vegetables, in addition to meats, beans, eggs, and flavorful cheeses. Roasting veggies for salads is the perfect cooking method as roasting intensifies the flavors. Who needs bland-tasting hothouse tomatoes in a salad when you can be creative with root cellar veggies and delicious combinations of spices, herbs, and vinegars. Try one of these beautiful and flavor-packed salads for lunch or dinner. Place farro in a large saucepan, add 3 cups water and salt and bring to a boil. Reduce heat to low and simmer until soft, about 30 minutes. Drain and rinse with cold water. Combine vegetables and cooked farro in a salad bowl. Whisk together the vinegar, oil, maple syrup, salt and pepper in a small bowl. Add to farro mixture and toss gently. 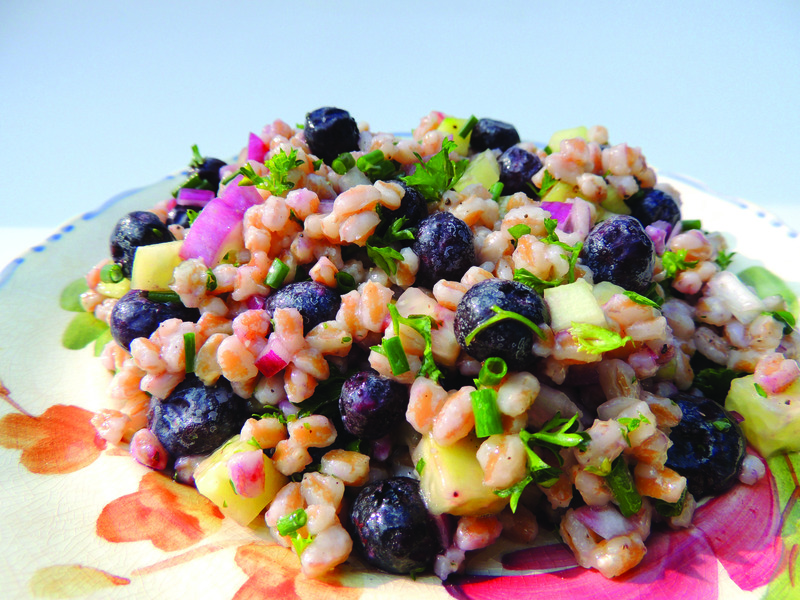 *We recommend soaking farro overnight before cooking to reduce the phytic acid, which is prevalent in all grains. Bring lentils and water to a boil, reduce heat to low, and cook until lentils are tender but not mushy, 15 to 20 minutes. Drain. Meanwhile, in a medium skillet, cook bacon over medium heat until crisp, about 8 minutes. Using a slotted spoon, transfer to a paper-towel-lined plate to drain. Add onion and carrots to bacon fat in skillet. Cook, stirring occasionally, until carrots are tender, 15 minutes. Add garlic, and cook another 2 minutes. In a medium bowl, whisk together vinegar, Dijon, oil, salt, and pepper. Combine lettuce and 1/3 of the dressing in another bowl; toss to coat. Add lentils, onion mixture, tomatoes, and bacon to bowl with remaining dressing; toss to coat. To serve, divide lettuce among salad plates and top with lentil salad. Preheat oven to 450 degrees. On a rimmed baking sheet, toss carrots, Brussels sprouts, garlic, and onion with 1 tablespoon oil; season with salt and pepper. Roast until vegetables are tender and browned, 20 to 25 minutes, tossing once. In a serving bowl, whisk together vinegar, cider, and remaining tablespoon oil; season with salt and pepper. Add lettuce, and toss. Top with roasted vegetables, goat cheese and pine nuts. Whisk together in a large bowl the lemon juice, oil, onion, salt and pepper. Add the beans, grains, and vegetables and toss until coated. Taste and adjust the seasonings.